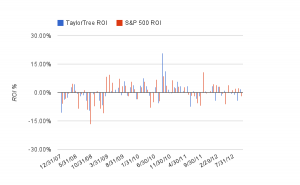 <  1.0: $1 invested returns < $1 (loss). <= 0: save your money. 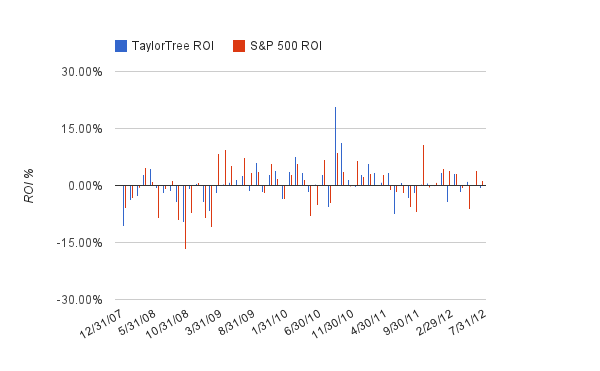 April:  Portfolio (-1.75%) vs SP500 (-0.75%). 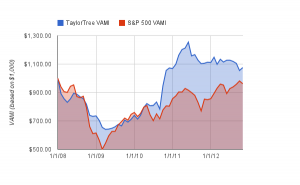 March:  Portfolio (+3.25%) vs SP500 (+3.13%). Very poor performance for the month of February. The overall market did wonderful. The portfolio was heading in to the last week of February with great results, as well. 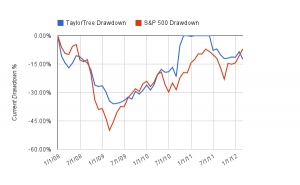 But, 2 stocks took the portfolio out of the running: TSRA & CPHD. This hit created the worst drawdown for the portfolio since 2010. 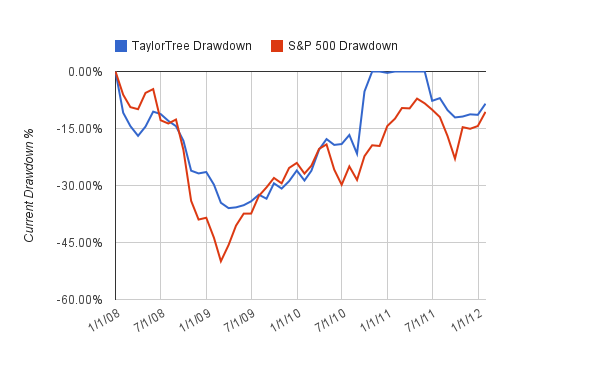 As a result of this drawdown; I am adjusting the trading system to account for volatility impacts. This is the first adjustment to the trading system since creation back in 2010. The adjustment involves overlaying a stock & market volatility filter to the system. On a brighter note; I am heading to Alabama for a little R&R with the family. We'll be around Lewis Smith Lake and the Birmingham area; so if anyone has any cool restaurants or places to see...drop me a line. Market beat us this month. But, it was a winning month and a good start to the new year. I'll take it. I'm doing something different for 2012. Reading Diary of a Commercial Commodities Trader from Peter Brandt gave me the idea. 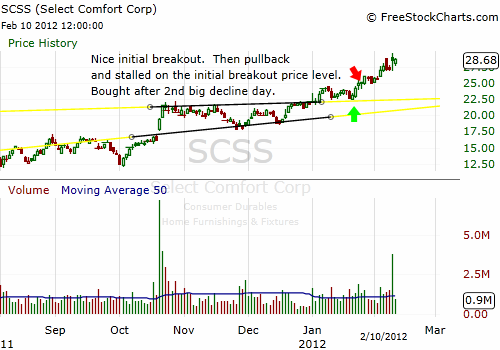 Peter does a great job of analyzing his trades from a chart technician perspective in real-time through the book. I normally don't care what the charts look like in choosing my trades. Just take the signals the system gives me. 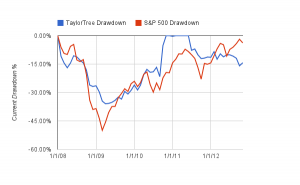 But, the system often generates too many trades for the amount of cash I have on hand. I've not had a good handle on which of the few from the many I should select for that day's cash on hand. 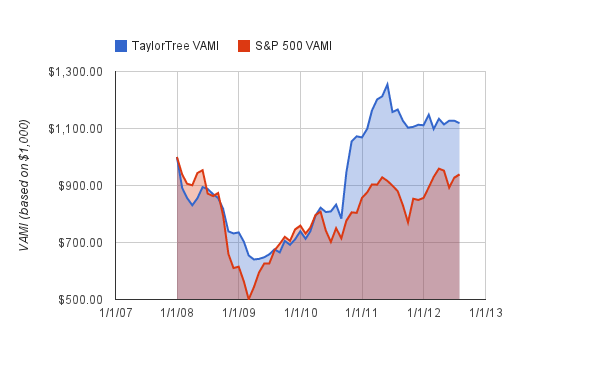 For 2012; I'll analyze each signal's chart before and after the trade. See what patterns emerge from this analysis. Worst case...just a bunch of random charts with no impact to the bottom line. Best case...I find a filter or new criteria to add to my system's signal selection process. Finally, want to thank my family for a wonderful visit in Texas. Great food and conversation. Awesome trip! I believed December was going to be a great month. You can see with a 78% win ratio...we were more right than wrong for the month. But, we took a really bad hit on one of the positions. That's what is difficult about the market right now. Most of the trading surprises are still to the downside. 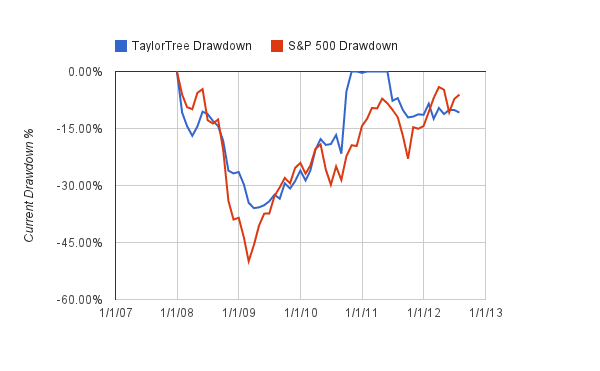 Looking forward to the trend of upward surprises. That's actually a study I might explore - tracking the surprise factor. 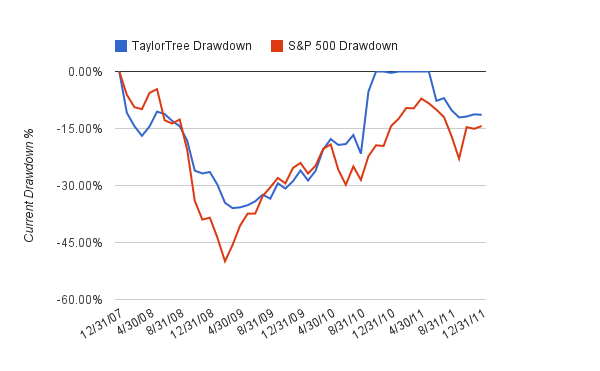 Is the market showing a trend of upside surprises or downside surprises? Or is the market caught in a surprise stasis? How do each of these scenarios effect the system? 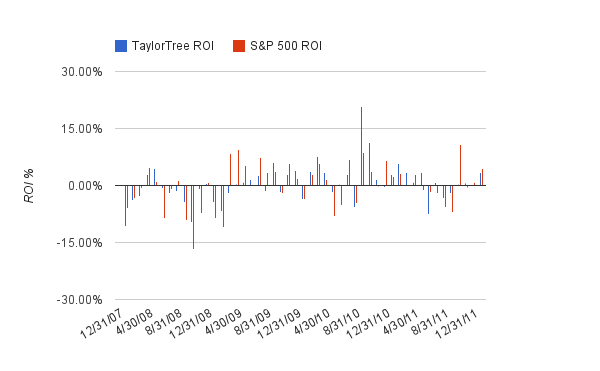 For the year of 2011 - the portfolio eaked out a +4.00% return. 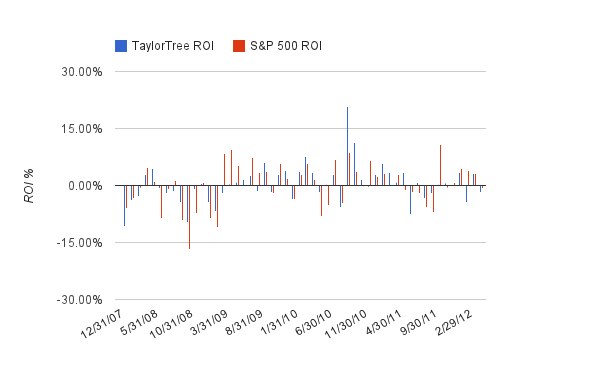 Given the volatility of the market; that's a whole lot of work for very little gain. But, we survived. Lived to play another year. In the end, glad to put 2011 to rest and start 2012. Another less than stellar month for the portfolio. Even though we sneaked in a win over the market...it was not enough to write home about. 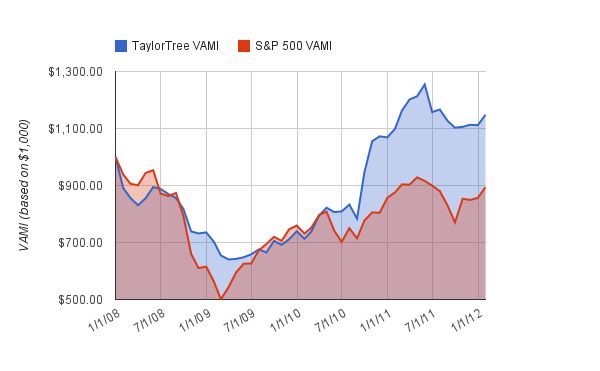 What this portfolio needs more than anything is a big winner to close out the year. But, time is definitely running out on that option. 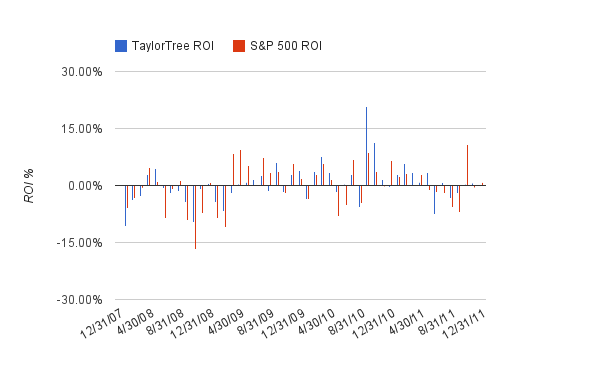 That's probably the most difficult part of trading the system in the back half of 2011 - the lack of big winners. The long-only system had the uncanny ability to miss almost all of the huge upside moves and catch most of the downside ones. Despite its penchant for missing the upside - the portfolio has hung in there and weathered a very volatile market environment. Explore a market direction filter for the system. I've exhausted many of the common ones already. 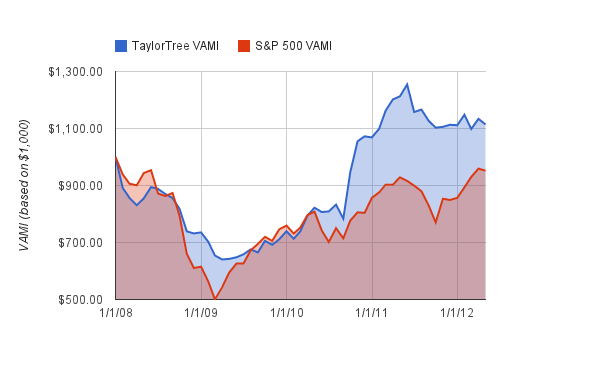 But, believe there may be some value in a breadth reading of all market instruments. 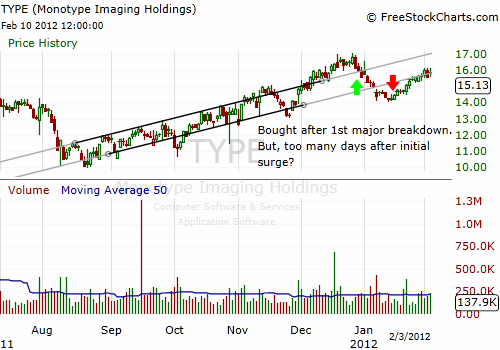 Possibly like the Breadth Ratio but instead of volume using ATR. Similar to the Vortex Ratio. 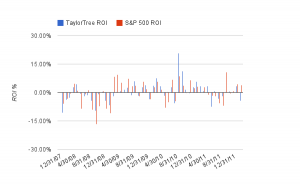 Another idea is to utilize the correlation reading of all market instruments to ascertain the investing environment. Determine if certain sectors are good or bad for the system. Over the past year I have observed the Pharmaceuticals and Oil & Gas sectors have not faired so well with the system. I still have not analyzed earning announcements and their possible impact on the system. This is a must to-do for 2012. That's it from the cold Midwest - where I'll spend the day smoking 2 Texas Dr. Pepper briskets. We'll use one of them for Tex-Mex tonight and the other for BBQ sandwiches tomorrow. Can't wait.